I love the way this word sounds in French: le fenouil. My mum once told me that my dad ate fennel for the first time after they got married. Ma mère : « —Ton père n’en avait jamais goûté avant. »�?�? Moi : « —Vraiment? Pas avant que vous vous mariez ? »�? My mum: “Your father had never tasted it before.�?�? Me: Really? Not before you got married?”�? I hope to claim that I ate fennel before I got married, because I really was surprised to hear that my dad had never eaten fennel before his early thirties. But I truly cannot remember what my story is with fennel. All I can say is that I really cherish this vegetable, all the more as I think it belongs to the forgotten greens family. The times when I would go to the grocery store and be asked by cashiers: “What is that?””Fennel.” “What did you say?” “F.E.N.N.E.L!” are numerous. It happens all the time! I just can eat fennel over and over again. I am not sure why but I use it quite often these days, simmered in safffron until it melts or marinated to make simple fresh salads. But wait! Simple but nonetheless refined, if you work a little bit on how you want to present it. As a matter of fact, I am not teaching you that the trick of an appetizing dish can simply lie in the presentation. A nice herb here, a rolled zucchini there, et le tour est joué ! Now you might ask: Comment ?Tu touches la nourriture avec les mains ? (Pardon? You touch food with our hands? Mais oui! This is the best way to feel it and know exactly how to arrange it on the plate! It certainly feels better. 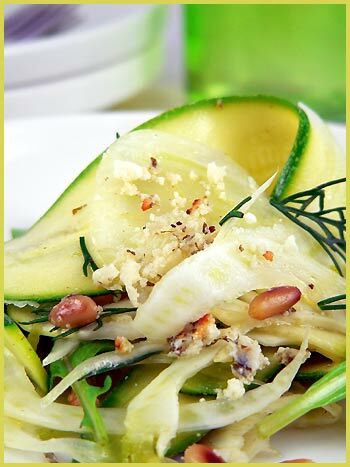 The salad consists of paper-thin cut slices of zucchini and fennel marinated in lemon juice and a fruity olive oil. No cooking time is required, which is all for the best with very hot days like the ones we have these days. 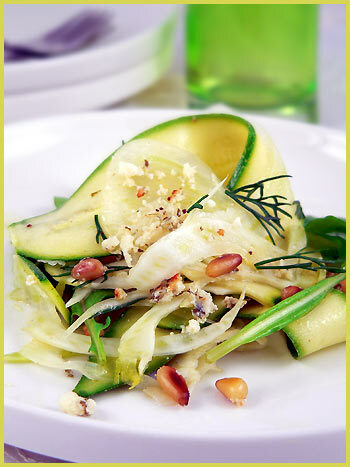 Add to it arugula, roasted pine nuts and feta cheese, sprigs of fresh herbs, and you get a lovely appetizer. And this is the idea: you can use the same dish that you then arrange in two different ways. The first one is a presentation for an elegant, more formal diner (as seen on the first picture), and the second one is for a casual diner entre-amis, à la bonne franquette (pictures below). In both cases, c’est bon et frais ! (It is good and fresh! ), and you can choose whichever you prefer. I usually like to play with food, so even for our regular meals, I often choose the first one. Playing with presentation is fun, don’t you agree? Lavez le fenouil et la courgette. Enlevez la partie intérieure dure du fenouil. Coupez les deux légumes en bandes de l’épaisseur d’une feuille de papier, en vous servant d’un bon couteau ou d’une mandoline. Mettez les légumes dans un bol. Mélangez ensemble le jus de citron et l’huile d’olive. Mélangez avec les légumes, et assaisonnez avec du sel et du poivre. Couvrez d’un film alimentaire et mettez au frigo pendant 1 heure. Lavez la roquette et égouttez-la. 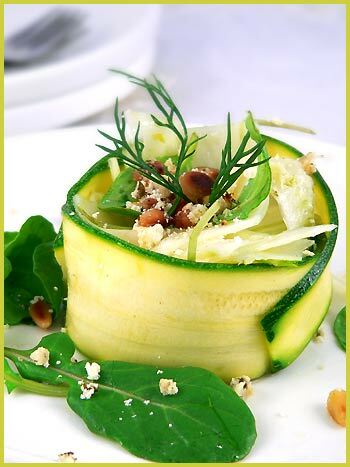 Placez un cercle au milieu et placez des bandes de courgettes marinées à l’intérieur. Mélangez le fenouil, la courgette et la roquette. Ajoutez les légumes au centre du cercle. Décorez avec la feta, les pignons de pin et l’aneth hachée. Bien plus simple puisque vous mélangez délicatement tous les ingrédients avant de les répartir entre les assiettes. nous voilà de nouveau en phase au dernier moment j’ai mis du concombre à la place de la courgette sinon nous aurions eu deux ingrédients sur trois. Je suis contente même avec la distance de partager cette entrée avec toi. C’est absolument superbe, simple, frais et de saison….que d’inspiration je trouve chez toi ! Magnifique, meme la version bonne franquette est superbe a voir. J’adore tous ces gouts, mais comme ton pere, je n’en ai pas goute avant tard, je ne sais pas pourquoi on n’en faisait pas dans ma famille. J’ai un peu de mal a le faire manger aux enfants mais je m’accroche. La première photo est magnifique, quelle fraîcheur ! C’est épatant : sur ton blog, on se croirait tout le temps dans un restaurant gastronomique ! J’ai dû te le dire plusieurs fois déjà, mais tes présentations et tes photos sont époustouflantes. Quant à ta salade, je vais m’empresser de la préparer, j’adore tout ce que tu as mis dedans. Quelle merveille encore une fois ! à cette heure-ci ton entrée donne vraiment envie… encore une photo pleine de talent ! So beautiful, Bea. Reminds me that I need to cook with fennel more! You are an artist. Your food and then your photo are beautiful. It has to taste wonderful. The other joy of fennel after eating it, is growing it. I love watching the Anise Swallow Tail caterpillers munch away at it. Then the butterflies appear and the plant recovers. Quelle artiste! Tes photos sont superbes, et cette salade si créative..
What a fabulous presentation Bea, a wonderful mix of textures !!! Ah oui Anne, je m’en vais de ce pas voir! Merci Mercotte de ton gentil message! Gracianne, merci et courage pour convaincre les petits. Ca en vaut le detour! Anaik, tu me flattes! Encore merci! J’aimerais bien cela dit que par magie, un de ces vrais chefs debarquent un jour dans ma cuisine! Choupette, je suis curieuse de voir si tu vas aimer! Geneve, thanks, too sweet of you! Lilo, ahah, il n’y a pas d’heure, n’est-ce pas? Dianka, thanks to you as well! Tanna, your note brings a big smile on my face. I would love to be able to see your garden! I feel it is a place full of treasures I would love to discover. Kat, thanks to you again! Archana, thanks for your nice comment! I am glad you like it! A tester avec la courgette mais je suivrai plus volontier AnneE pour la version Concombre. Merci à toi et très bonnes vacances si elles commencent. Bizarrement, je me rappelle l’voir consommé en antipasti, mariné et là, il était étonnamment bien passé, peut-être faudrait-il que je retente l’expérience ?! How do you do this so beautifully? You are a true artist. Bea you never fail to impress, delightful, I can’t wait to give it a try! Gabriella and Bron, thanks, too sweet of both of you!